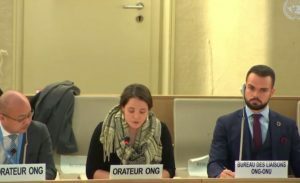 Lawyers’ Rights Watch Canada joined International Service for Human Rights (ISHR) in the following oral statement given at the China’s Universal Periodic Review on 15 March 2019 at the UN Human Rights Council in Geneva. We deliver this statement in honour of Cao Shunli and of all defenders unjustly detained for promoting human rights in the People’s Republic of China. While China regularly urges cooperation and dialogue, its approach to the UPR was anything but. A categoric rejection of recommendations on access to Xinjiang and the detention of Muslim minorities is the most jarring example. The government also refused all recommendations related to the abolition of the death penalty, and the ratification of the ICCPR. China’s claims that some recommendations are ‘accepted and already implemented’ are insidious, giving a veneer of cooperation, while minimising the challenges of protecting and promoting human rights. China claims recommendations on women’s rights were ‘accepted and already implemented’, yet Chinese women human rights defenders face great challenges. The oldest and most respected social media account discussing women’s rights was shut down on March 8 last year; discrimination in employment is pervasive; and activists are regularly harassed for their work against sexual harassment. Nonetheless, Chinese feminists persist. China said the same with regard to rights of LGBTI persons, yet civil society efforts to combat discrimination and ensure equality through the courts are undercut by official policies, including some banning ‘homosexual content’ in media. Nonetheless, in China too, love is love is love. Finally, we note that a recommendation on ensuring safe participation of civil society at the UN was ‘accepted and already implemented’. If this is the case, we demand a transparent, independent investigation into Cao Shunli’s death, five years ago this week, and accountability for the individuals responsible. We urge China to seriously engage with the UN human rights system, not use it as a fig leaf, and commit to engaging with a broad range of independent civil society actors to advance human rights in the country.